Intrepid Lorna Fisher is gearing up for an epic 1,600-mile cycle ride – taking in all 15 UK national parks in just two weeks. Lorna – a Peak District National Park engagement manager who leads a team of rangers – begins her challenge in the Cairngorms on 13 April. She will pedal through national parks in Scotland, Wales and England, ending in the Broads National Park on 27 April. She will cycle through the New Forest on 25 April. 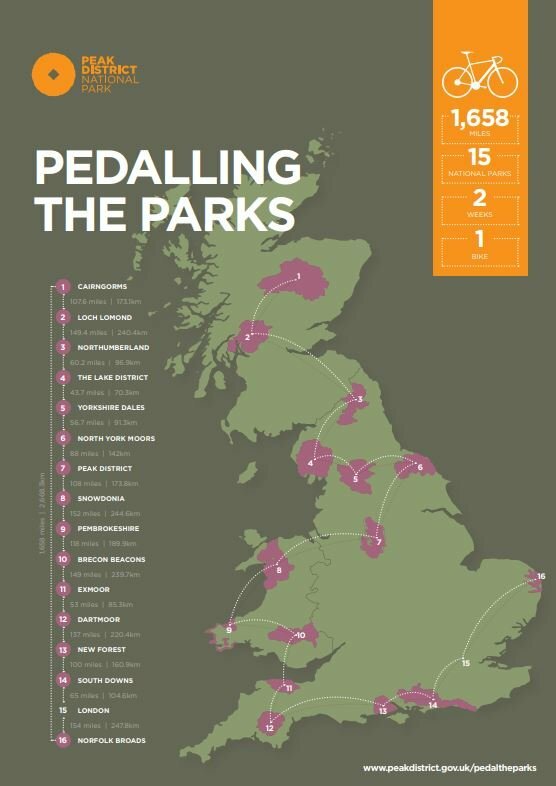 Lorna’s marathon bike ride coincides with Discover National Parks Fortnight (6 – 21 April), reflecting on the 70th anniversary of legislation which ultimately led to the Peak District becoming the UK’s original national park in 1951. She said: ‘I’m an explorer at heart who loves being outside. I am at my happiest when walking in the hills, whizzing along country lanes, simply exploring. ‘I’ve previously taken part in 400km and 600km audaxes (time-limited distance rides), but at around 2,500km over two weeks this will be like nothing else I’ve attempted before. ‘In my role at the Peak District National Park I’m incredibly lucky to have the opportunity to inspire and engage others, sharing my passion for the natural world. Lorna will be supported along the way by Clif Bar – supplier of nutritional foods for athletes, and the YHA providing a place for Lorna to rest up between stages. A full map of Lorna’s route can be found at www.peakdistrict.gov.uk/pedallingtheparks. You can follow Lorna’s progress on social media on @peakdistrict on Twitter and Facebook, and with the hashtag #PedaltheParks.